OnePlus 7 flagship phone is expected to launch globally on May 14. According to a new leak, the next-gen OnePlus flagship will be announced at an event that will be held exactly a month from now, and the OnePlus 7 Pro will also be launched alongside . The company is now rumoured to launch multiple variants of the OnePlus flagship this time. A previous leak suggested that there will be three variants of the OnePlus 7 – OnePlus 7 vanilla variant, OnePlus 7 Pro, and the OnePlus 7 Pro 5G. Tipster Ishan Agarwal suggests that the OnePlus 7 flagship series will be launched on May 14 globally. He also leaks that multiple variants of the OnePlus 7 will be launched this time. 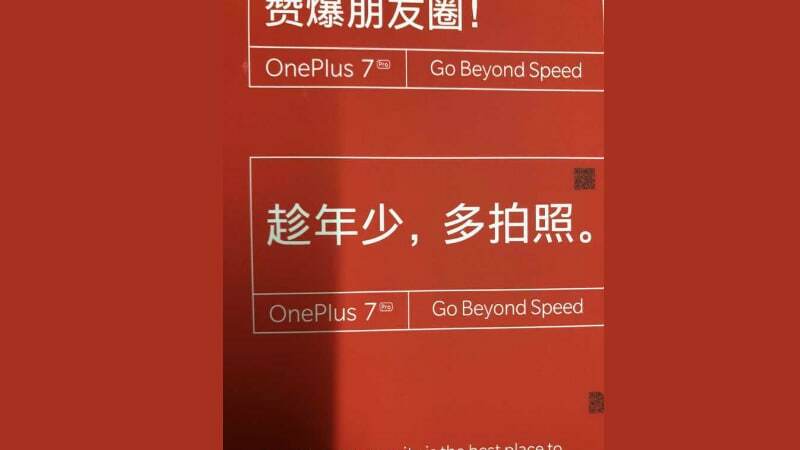 Agarwal shares an earlier leaked image poster alongside hinting that the OnePlus 7 Pro will also be launched alongside. The poster reveals the new tagline ‘Go Beyond Speed'. There's no confirmation from OnePlus' end as of yet. The poster was leaked on Weibo a few days ago. Agarwal had tipped earlier that the OnePlus 7 vanilla variant, OnePlus 7 Pro, and OnePlus 7 Pro 5G will be launched this time. If true, this is probably the first time OnePlus is releasing multiple variants of its flagship at launch. Earlier, OnePlus has at launch only unveiled multiple RAM + Storage variants, but never a different variant altogether. OnePlus 7 case renders suggest a triple rear camera setup aligned vertically. It appears to have a thin-bezel display -- thanks to its pop-up selfie camera module. At the bottom, the alleged OnePlus 7 cases have cut-outs for a USB Type-C port as well as the loudspeaker grill and two microphones. An earlier case leak also suggested that the SIM card tray will sit at the bottom, something that isn't seen in the latest case leak. While specification leaks of the OnePlus 7 are scarce at the moment, CEO Pete Lau had confirmed earlier that the phone will not support wireless charging. As per an image leak, the OnePlus 7 Pro is tipped to sport a dual edged display, similar to the Galaxy S10+. The phone is tipped to sport a 6.67-inch Super Optic display, a Snapdragon 855 processor paired with 8GB RAM, 256GB of internal storage, a triple rear camera setup – with one 48-megapixel sensor, another 16-megapixel sensor, and a last 8-megapixel sensor, and run on Android Pie. OnePlus is also expected to launch truly wireless earbuds alongside the three phones.